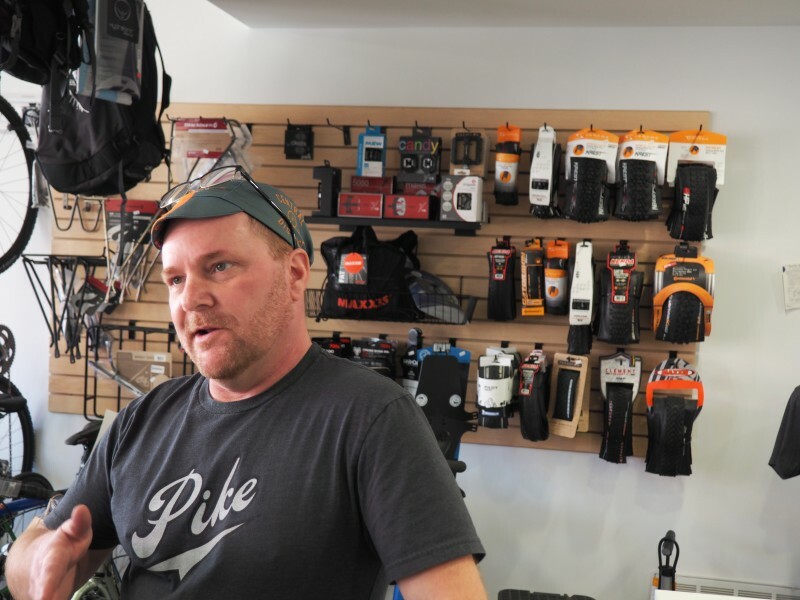 Nate Phelps, owner of the Central District Cyclerly bike shop newly settled in the North side, is already getting involved in the neighborhood. The shop sign went up on the new storefront March 28, making the newcomer official. However, Phelps joined a group of shop employees to attend the pancake breakfast hosted by the Creston Neighborhood Association on March 19. Being positive, active parts of the Creston neighborhood is part of why Phelps picked the new location. Phelps hopes CDC adds to that neighborhood vibrancy by moving his bike shop from downtown Grand Rapids on Monroe Center, where it was located for four years. He was leasing space there ever since he opened the shop in 2012, but with downtown booming and real estate growing more expensive he knew he needed to look into other options. The new location opened its doors to the Creston neighborhood on March 2. Phelps, 47, believes he moved Central District Cyclery into the Creston Business District, which includes the Plainfield stretch between Leonard and Knapp, at just the right time. Things have been looking up in the area for a while and there’s more to come with Creston Brewing opening this spring. “It’s going to blow up,” Phelps said matter-of-factly of the neighborhood. Deborah Eid said positive vibes in the Creston neighborhood are the result of a lot of hard work and planning. Eid is Executive Director of the Creston Neighborhood Association and manager of the North Quarter Corridor Improvement District. In addition to the brewery, Eid pointed to Brighton Graye’s Bistro and Little Lucy’s Cafe & Bakery also scheduled to open by summer, as well as Creston Market’s makeover last year. The new location is actually downsizing for Phelps, to 1,700 square feet, but it’s got more parking available for customers and he was able to purchase the lower level of the two-level building instead of continuing to lease. The upper level is a residential condo owned by established Creston-area developer Bradley Hartwell. While he called the move out of downtown “big,” Phelps noted the new location, in the former Jimmy’s BBQ restaurant, remains easily accessibly to the city center. He’s still a strong supporter of downtown Grand Rapids. 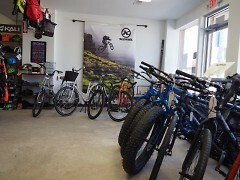 In the new space, where Phelps has five employees, CDC has a typical sales floor with bikes, clothing and equipment displayed, a lower level service bay for repairs and maintenance, a separate office with shower facility, and storage. The biggest new addition is a small coffee bar, where the shop offers a “mug club” at $35 per person for up to 50 members featuring hand-tossed ceramic coffee mugs and store perks. Phelps put down his coffee on a recent Monday morning to help a customer with an older model Schwinn Moab mountain bike. A local resident, the man was stopping in for the first time to get his girlfriend’s bike a much needed tune-up and new set of tires to get ready for the season. That’s exactly what Phelps said he is hoping for in the new, more convenient location, where customers won’t have any trouble finding parking. He also plans to open the shop a little earlier in the morning and the store will be open seven days a week through the peak season. CDC will continue to carry the full line of Kona bikes, along with Fatback and Fyxation. More brands are likely to be added in the next year. Phelps said he has a special relationship with Kona, based in Ferndale, Wash., which has been integral to the success of the shop. Phelps said he maintains the idea of making the bike show employee-owned one day. That is centered on three key employees who are making the move with the shop: Erika Hanson, lead mechanic and service manager; Kent Sinclair, shop sales; and Aaron Clark, bike maintenance and coffee operations. Hanson attended training recently at Appalachian Bicycle Institute in Asheville, N.C., to prepare for the change. She has worked in the bike industry for six years. Hanson said among the things she likes about working at Central District are the fact that everyone on staff likes to ride bikes and get involved in advocating for bikes in West Michigan. Phelps has a long history as a regional bike advocate, for example. While he is newer to owning a bike shop, Phelps is no stranger to the area cycling community. He was involved in the development of many of the mountain biking trails in the region. Phelps continues to be involved as a board member of the Greater Grand Rapids Bicycle Coalition, as well as several cycling events he hosts. Central District Cyclery regularly holds cyclocross events known as Fall Fury, fatbike events known as the Winter Rush series, and Phelps is involved in State Games of Michigan. This summer, Grand Rapids will host the mountain bike state championship and the next two winters Grand Rapids is scheduled to host the USA Cycling national fatbike championships at Indian Trails Golf Course. But Phelps isn’t content to sit back and watch cycling. He plans shop hours so that he can be sure to join in evening rides – along with his employees. “We like to get out and ride in the evening,” Phelps said. 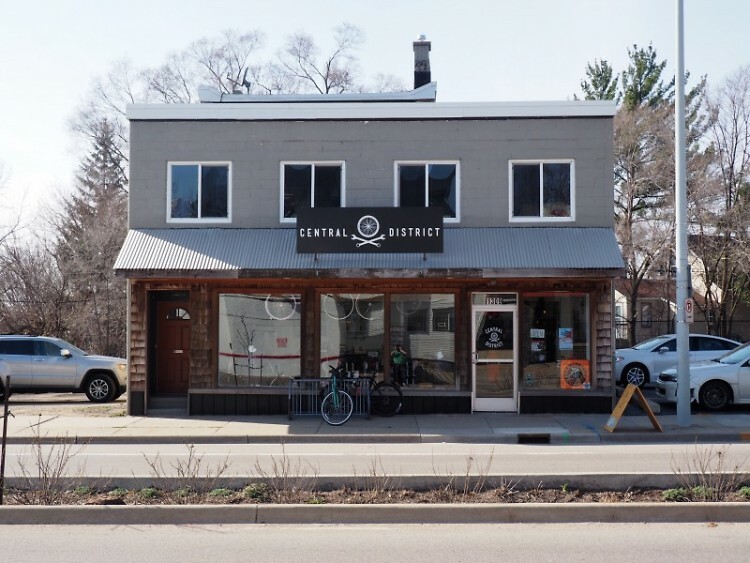 For more on Central District Cyclery and its new location, check out the website or call 616-446-1420. The shop is open seven days a week during peak season.